Well, I got this quilt all sandwiched and half quilted before I realized the bottom was bunching up. Such a bummer. That’s what I get for using discount basting spray that’s at least 2 years old. I spent two hours with a seam ripper removing half of the stippling I’ve done, and I just don’t feel like taking a picture of it. 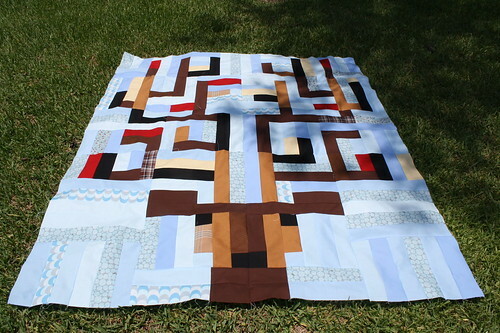 So instead, I’ll just share my finished quilt top before it was marred with a zillion needle holes. I’d love to be doing more sewing. Let’s hope that now that school has started, there will be more time. Hope everyone had a great summer!